This is “Work and Labor in the United States”, section 10.4 from the book Sociology: Brief Edition (v. 1.1). For details on it (including licensing), click here. Discuss the changes industrialization brought in the relationship between workers and management. Outline recent trends in jobs and wages. Assess Marx’s prediction regarding the alienation of work in a capitalist society like the United States. The history of work and labor in the United States reflects the change, discussed earlier, in economies from agricultural to industrial to postindustrial. From the time the colonies began in the 1600s until well into the 19th century, the United States was primarily an agricultural society, as people worked on their own farms, and the family was the major unit of economic production. With the advent of industrialization came machines and factories, and the secondary, manufacturing sector became dominant. In the decades after the Civil War, the Industrial Revolution transformed the nation. One of the most important developments accompanying industrialization was the rise of labor unions and their conflict with management over wages and working conditions (Dubofsky & Dulles, 2010).Dubofsky, M., & Dulles, F. R. (2010). Labor in America: A history (8th ed.). Wheeling, IL: Harlan Davidson. The pay that workers received was quite low, and the conditions in which they worked were often miserable. The typical employee worked at least 10 hours a day for 6 or 7 days a week, with almost no overtime pay and no paid vacations or holidays. To improve wages and working conditions, many labor unions were founded after the Civil War, only to meet determined opposition from companies, the government, and the courts. Companies told each other which workers were suspected of being union members, and these workers were then prevented from getting jobs. 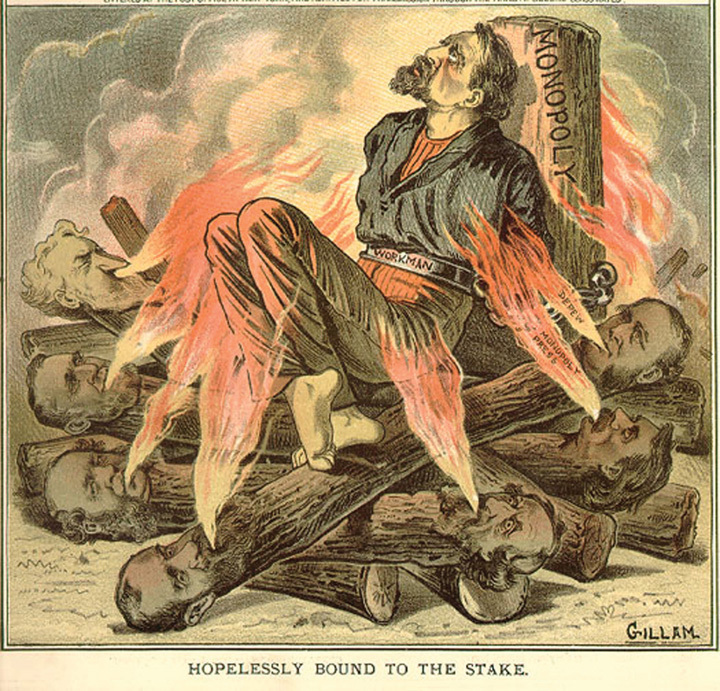 Strikers were often arrested for violating laws prohibiting strikes. When juries began finding them not guilty, employers turned to asking judges for injunctions that prohibited strikes. Workers who then went on strike were held in contempt of court by the judge as juries were kept out of the process. Many strikes became violent, as companies brought in armed guards, state troopers, and strikebreakers to put down the strikes. Workers themselves rioted to protest their low wages and abject working conditions. Summarizing this period, two labor historians note that the United States “has had the bloodiest and most violent labor history of any industrial nation in the world” (Taft & Ross, 1990, p. 174).Taft, P., & Ross, P. (1990). American labor violence: Its causes, character, and outcome. In N. A. Weiner, M. A. Zahn, & R. J. Sagi (Eds. ), Violence: Patterns, causes, public policy (pp. 174–186). San Diego, CA: Harcourt Brace Jovanovich. During an 1897 coal-mining strike in Pennsylvania, for example, 18 miners were killed and 40 wounded after being shot in the back by sheriff’s deputies. Several years later, company guards and state troops in Ludlow, Colorado, opened fire on mining families as they fled from a tent city that the guards and troops had set on fire. Their bullets killed more than two dozen people, including 13 children (McGovern & Guttridge, 1972).McGovern, G. S., & Guttridge, L. F. (1972). The great coalfield war. Boston, MA: Houghton Mifflin. From the 1870s through the 1930s, labor unions fought companies over issues such as low wages and substandard working conditions. Source: Photo courtesy of Special Collections and Archives, Georgia State University Library, http://www.library.gsu.edu/spcoll/spcollimages/labor/19clabor/Labor%20Prints/80-39_1.jpg. Labor strife reached a peak during the Great Depression, as masses of people blamed business leaders for their economic plight. Huge sit-ins and other labor protests occurred in Detroit at auto plants. In response the Congress passed several laws that gave workers a minimum wage, the right to join unions, a maximum-hour workweek, and other rights that Americans now take for granted. Today labor unions have lost some of their influence, especially as postindustrialization has supplanted the industrial economy and as the United States has lost much of its manufacturing base. Four decades ago, about one-fourth of all private-sector nonagricultural workers belonged to labor unions. By 1985 this figure had dropped to 14.6%, and today it stands at less than 8% (Hirsch & Macpherson, 2009).Hirsch, B., & Macpherson, D. (2009). Union membership and coverage database from the CPS. Retrieved from http://unionstats.com In response, labor unions have ramped up their efforts to increase their membership, only to find that U.S. labor laws are filled with loopholes that allow companies to prevent their workers from forming a union. For example, after a company’s workers vote to join a union, companies can appeal the vote, and it can take several years for courts to order the company to recognize the union. In the meantime, the low wages, the working conditions, and other factors that motivated workers to want to join a union are allowed to continue. Recall that the United States has joined other industrial nations in moving into postindustrial economies. If physical prowess and skill with one’s hands were prerequisites for many industrial jobs, mental prowess and communication skills are prerequisites for postindustrial jobs. This move to a postindustrial economy has been a mixed blessing for many Americans. The information age has obvious benefits too numerous to mention, but there has also been a cost to the many workers whom postindustrialization and the globalization of the economy have left behind. Since the 1980s many manufacturing companies moved their plants from U.S. cities to sites in the developing world in Asia and elsewhere, a problem called capital flight. This shift has helped fuel a loss of more than 1.5 million manufacturing jobs in the United States (Mishel et al., 2009).Mishel, L., Bernstein, J., & Shierholz, H. (2009). The state of working America 2008/2009. Ithaca, NY: ILR Press [An imprint of Cornell University Press]. A related problem is outsourcing, in which U.S. companies hire workers overseas for customer care, billing services, and other jobs that Americans used to do. China, India, and the Philippines, which have skilled workforces relatively fluent in English, are the primary nations to which U.S. companies outsource their work. At least four million jobs are estimated to have been transferred to these nations from the United States and other Western countries (Thomas, 2009).Thomas, M. (2009, July 16). Outsourcing statistics: What figures will tell you. EzineArticles. Retrieved from http://ezinearticles.com/?Outsourcing-Statistics---What -Figures-Will-Tell-You&id=2621948 Many call centers employ workers in India, and when you call up a computer company or some other business for technical help, you might very well talk with an Indian. Because these call centers have cost Americans jobs and also because Americans and Indians often have trouble understanding each other’s accents, outsourcing has been very controversial in the decade since it became popular. All of these problems reflect a more general shift in the United States from goods-producing jobs to service jobs. Although some of these service jobs, such as many in the financial and computer industries, are high paying, many are in low-wage occupations, such as restaurant and clerical work, that pay less than the goods-producing jobs they replaced. Partly as a result, the average hourly wage (in 2007 dollars) in the United States for workers (excluding managers and supervisors) rose from only $16.88 in 1979 to $17.42 in 2007. This change represented an increase of just 0.1% per year during that three-decade span (Mishel et al., 2009).Mishel, L., Bernstein, J., & Shierholz, H. (2009). The state of working America 2008/2009. Ithaca, NY: ILR Press [An imprint of Cornell University Press]. These wage figures mask an important gender difference. Men’s median hourly wages dropped (in 2007 dollars) by 4.4% from 1979 to 2007, while women’s wages rose by 24.4% (while still remaining $3.11 less per hour than men’s wages in 2007) (Mishel et al., 2009).Mishel, L., Bernstein, J., & Shierholz, H. (2009). The state of working America 2008/2009. Ithaca, NY: ILR Press [An imprint of Cornell University Press]. Although, as we saw in Chapter 8 "Gender and Gender Inequality", women have been catching up to men in wages, some of this catching up is due to the decline in male wages. Wage changes in recent years also depend on what social class someone is in. While the average compensation of chief executive officers (CEOs) of large corporations grew by 167% from 1989 to 2007, the average compensation of the typical worker grew by only 10%. Another way of understanding this disparity is perhaps more striking. In 1965 CEOs earned 24 times more than the typical worker; in 2007 they earned 275 times more than the typical worker (Mishel et al., 2009).Mishel, L., Bernstein, J., & Shierholz, H. (2009). The state of working America 2008/2009. Ithaca, NY: ILR Press [An imprint of Cornell University Press]. The civilian labor force consists of all noninstitutionalized civilians 16 years of age or older who work for pay or are looking for work. The civilian labor force (hereafter labor force) consists of about 154 million people, or almost two-thirds of the population, including about 72% of men and 59% of women (Bureau of Labor Statistics, 2009).Bureau of Labor Statistics. (2009). Employment and earnings online. Washington, DC: Bureau of Labor Statistics, U.S. Department of Labor. Retrieved from http://www.bls.gov/opub/ee/home.htm Chapter 8 "Gender and Gender Inequality" noted that women’s labor force participation soared during the last few decades. This general increase is even steeper for married women with children under 6 years of age: in 2007 almost 62% of such women were in the labor force, compared to less than 19% in 1960 (U.S. Census Bureau, 2009), a threefold differenceU.S. Census Bureau. (2009). Statistical abstract of the United States: 2009. Washington, DC: U.S. Government Printing Office. Retrieved from http://www.census.gov/compendia/statab (see Figure 10.16 "Labor Force Participation Rate, Percentage of Married Women with Children Younger Than 6 Years of Age, 1960–2009"). Unemployment is a fact of life. There will always be people laid off or fired, who voluntarily quit their jobs, or who just graduated school and are still looking for work. But most unemployed people are involuntarily unemployed, and for them the financial and psychological consequences can be devastating. We have just seen that unemployment rises when the economy falters and that race and ethnicity affect the probability of being unemployed. These two facts provide evidence supporting the sociological imagination. As C. Wright Mills (1959)Mills, C. W. (1959). The sociological imagination. London, England: Oxford University Press. emphasized in his original discussion of this concept, it is best viewed more as a public issue than as a personal trouble. When so many people are unemployed during an economic recession and when there is such striking evidence of higher unemployment rates among the persons of color who have the least opportunity for the education and training needed to obtain and keep a job, it is evident that high unemployment rates reflect a public issue rather than just a collection of public troubles. Several kinds of problems make it difficult for people of color to be hired into jobs and thus contribute to the racial/ethnic disparity in unemployment. The “Sociology Making a Difference” box discusses these problems. Sociological research has documented that people of color face several kinds of problems in securing employment. While their relative lack of education is an obvious factor, other kinds of problems are also apparent. One problem is racial discrimination on the part of employers, regardless of how conscious employers are of their discriminatory behavior. Chapter 7 "Race and Ethnicity" recounted a study by sociologist Devah Pager (2007),Pager, D. (2007). Marked: Race, crime, and finding work in an era of mass incarceration. Chicago, IL: University of Chicago Press. who had young white and African American men apply independently in person for various jobs in Milwaukee. These men wore the same type of clothing and reported similar levels of education and other qualifications. Some said they had a criminal record, while others said they had not committed any crimes. In striking evidence of racial discrimination in hiring, African American applicants without a criminal record were hired at the same low rate as white applicants with a criminal record. Pager and sociologists Bruce Western and Bart Bonikowski also investigated racial discrimination in another field experiment in New York City (Pager, Bonikowski, & Western, 2009).Pager, D., Bonikowski, B., & Western, B. (2009). Discrimination in a low-wage labor market: A field experiment. American Sociological Review, 74(5), 777–799. They had white, African American, and Latino “testers,” all of them “well-spoken, clean-cut young men” (p. 781), apply in person to low-level service jobs (e.g., retail sales and delivery drivers) requiring no more than a high school education; all the testers had similar (hypothetical) qualifications. Almost one-third (31%) of white testers received a call back or job offer, compared to only 25.2% of Latino testers and 15.2% of African American testers. The researchers concluded that their findings “add to a large research program demonstrating the continuing contribution of discrimination to racial inequality in the post-civil rights era” (p. 794). Other kinds of evidence also reveal racial discrimination in hiring. Two scholars sent job applications in response to help-wanted ads in Boston and Chicago (Bertrand & Mullainathan, 2003).Bertrand, M., & Mullainathan, S. (2003). Are Emily and Greg more employable than Lakisha and Jamal? A field experiment on labor market discrimination. National Bureau of Economic Research (Working Paper No. 9873). Retrieved from http://papers.nber.org/papers/w9873.pdf They randomly assigned the applications to feature either a “white-sounding” name (e.g., Emily or Greg) or an “African American–sounding” name (e.g., Jamal and Lakisha). White names received 50% more callbacks than African American names for job interviews. Racial differences in access to the informal networks that are often so important in finding a job also contribute to the racial/ethnic disparity in employment. In a study using data from a nationwide survey of a random sample of Americans, sociologist Steve McDonald and colleagues found that people of color and women are less likely than white males to receive informal word of vacant, high-level supervisory positions (McDonald, Nan, & Ao, 2009).McDonald, S., Nan, L., & Ao, D. (2009). Networks of opportunity: Gender, race, and job leads. Social Problems, 56(3), 385–402. As these studies indicate, research by sociologists and other social scientists reveals that race and ethnicity continue to make a difference in employment prospects for Americans. This body of research reveals clear evidence of discrimination, conscious or unconscious, in hiring and also of racial/ethnic differences in access to the informal networks that are often so important for hiring. By uncovering this evidence, these studies underscore the need to address discrimination, access to informal networks, and other factors that contribute to racial and ethnic disparities in employment. For this reason, sociology is again making a difference. Recall that Karl Marx thought that job alienation was a major problem in industrial societies. Following up on his concern, social scientists have tried to determine the extent of worker alienation and job satisfaction, as well as its correlates (Bockerman & Ilmakunnas, 2009).Bockerman, P., & Ilmakunnas, P. (2009). Job disamenities, job satisfaction, quit intentions, and actual separations: Putting the pieces together. Industrial Relations, 48(1), 73–96. They generally find that American workers like their jobs much more than Marx anticipated, but also that the extent to which they like their jobs depends on the income their jobs bring, the degree of autonomy they enjoy in their jobs, and other factors. One way of measuring job satisfaction is simply to ask people, “On the whole, how satisfied are you with the work you do?” The General Social Survey uses precisely this question, and 86% of respondents (2010 data) say they are satisfied with their jobs, with only 14% saying they are dissatisfied. This latter figure is probably lower than Marx would have predicted for a capitalist society like the United States. 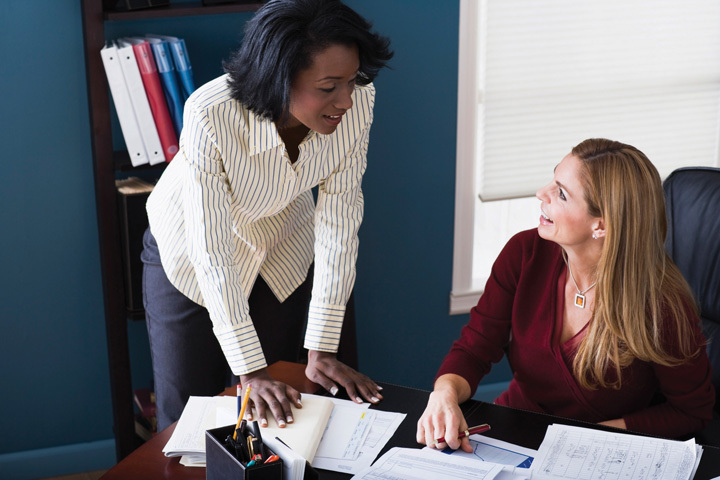 Friendships among employees are very common and may contribute to high levels of satisfaction with one’s job in the United States. One possible reason for the low amount of job dissatisfaction, and one that Marx did not foresee, is that workers develop friendships in their workplace (McGuire, 2007).McGuire, G. M. (2007). Intimate work: A typology of the social support that workers provide to their network members. Work and Occupations, 34, 125–147. Coworkers discuss all kinds of topics with each other, including personal matters, sports, and political affairs, and they often will invite other coworkers over to their homes or go out with them to a movie or a restaurant. Such friendships can lead workers to like their jobs more than they otherwise would and help overcome the alienation they would feel without the friendships. Such coworker friendships are quite common, as research finds that about half of all workers have at least one close friend who is a coworker (Marks, 1994).Marks, S. R. (1994). Intimacy in the public realm: The case of co-workers. Social Forces, 72, 843–858. In the aftermath of industrialization, management and labor clashed over wages and working conditions. During the last few decades, goods-producing jobs have declined and service jobs have increased as the United States has moved further into the postindustrial, information age. Job satisfaction is higher and worker alienation lower than what Karl Marx would have predicted for the United States, thanks in part to workplace friendships. Fewer workers belong to labor unions now than just a few decades ago. Do you think this is a good development or a bad development? Explain your answer. Think of a job you now have or your most recent job if you are currently not employed. On a scale of 1 = very dissatisfied to 10 = very satisfied, how satisfied are you (were you) with your job? Explain why you have (had) this level of satisfaction.